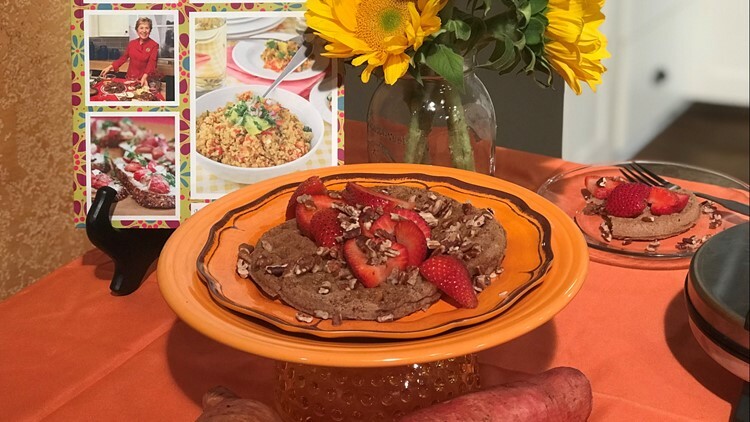 Taste and Savor's Chef Nancy Waldeck shares yummy waffles. Get them below and tag A&C on our Facebook page or tweet/tag @atlandco to be featured. Grease and preheat the waffle iron according to manufacturer instructions. Place all ingredients in blender and blend until smooth and incorporated. Ladle 1/3 cup of mixture unto a waffle and cook until golden on both sides. To serve try chopped roasted pecans and fresh fruit. To make sweet potato puree roast sweet potatoes at 400 degrees for 45 minutes, or until fork tender. (Or microwave them until done – about 6 – 10 minutes depending on size.) Scoop out inside of sweet potato and mash or put in blender and puree until smooth. Make the sandwiches: Spread the mayonnaise/mustard mixture evenly over the side of 4 the waffles. Top each with the sliced avocado, the ham, cheese, and greens. Cover with the remaining waffles, then transfer the sandwiches to a large baking sheet. Spray with olive oil spray. Place an ovenproof weight on top (such as a large cast iron skillet) and bake until warm, 10–12 minutes. 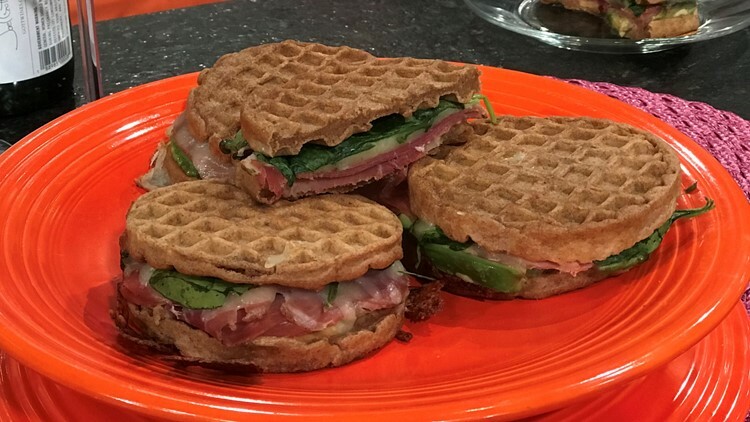 An American Pinot Gris from the Pacific Northwest can bridge the gap between the slightly sweeter sweet potato waffle and the savory waffle sandwich. It's rich and fruit forward without being sweet!